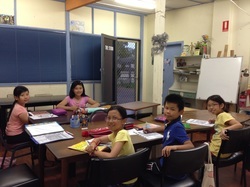 The Reading & Writing session for Yr.3-6 takes place every Saturday from 5.30pm to 7.00pm. There were five happy kids in the first lesson. The children first introduced themselves in both oral and written practice. Then they expressed their own prior knowledge about places in the world through discussion. Afterwards, they read aloud the same CNY passage from Yr.1-3 and used it as a writing scaffold for an invitation letter. This group will be encouraged to read extensively and independently to increase general knowledge needed for writing. Literature appreciation, author's profile, biography, children's magazine and family quiz will be included in the upcoming lessons. At the same time, common text types such as narrative, recount, description, report, letter, poetry, exposition as well as argument, and their language features will all be covered. There are six lessons left in term 1, but enrolments are still welcome for effective interaction in class.